Show Floor Area 2006: 80,050 sq. m.
This was the second year in a row for paticipation by OneCNC Germany. Uwe OneCNC Germany, Stepahn OneCNC Germany, Sebastian OneCNC Poland, Allan OneCNC Denmark and Bob from OneCNC Australia were on hand to demonstrate the new features of OneCNCXR2 at the show. 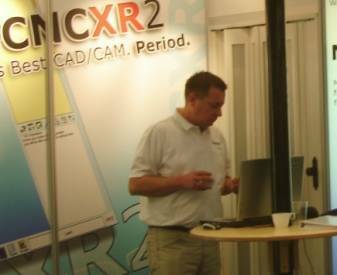 Here we see Allan OneCNC Denmark (left) demonstrating OneCNC products. 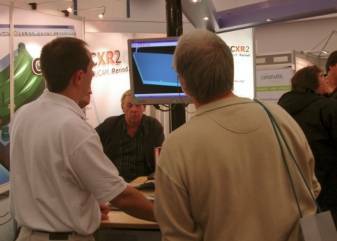 Here Sebastian OneCNC Poland demonstration the new ability of OneCNCXR2 at the show. Here we see Uwe hard at it often before during and after the show specialised on-line technical support for customers is done as if it was a normal day at the office. 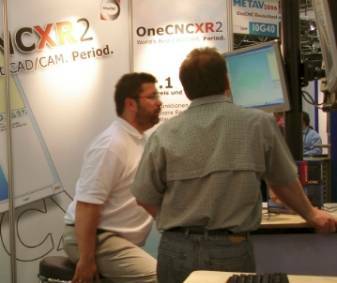 Here we see Stephan OneCNC Germany (left) demonstrating the new features of OneCNCXR2 to a customer. OneCNC booth is on the right and the booth opposite we were not sure if the wall graphic was because OneCNC was the most competitive and most active at the show. 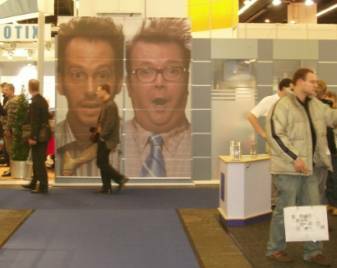 The METAV2006 was held in Dusseldorf 20th to 24th June 2006. 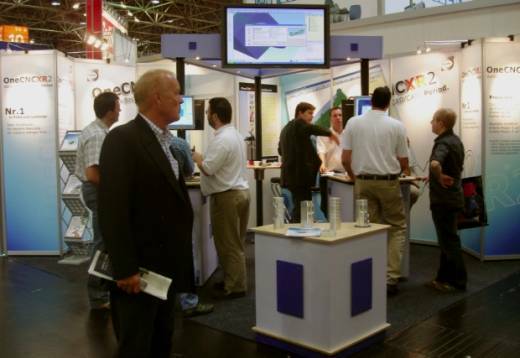 At this year’s METAV Düsseldorf 47,500 trade visitors made for a busy show. There were 925 exhibitors from 21 countries and the quality of visitors was high and OneCNC concluded more deals than expected. 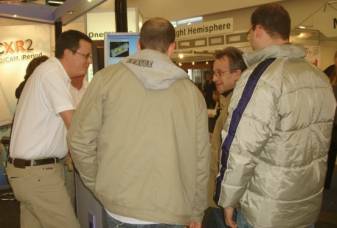 We believe most exhibitors were satisfied with how the trade fair went because it was quite busy each day. We would have liked to see even more visitors however with the World Cup on at the same time obviously many people went into the stadiums or or stayed to watch it on TV. In attendance from OneCNC was Uwe OneCNC Germany, Stephan OneCNC Germany, Allan OneCNC Denmark and Bob from OneCNC Australia. 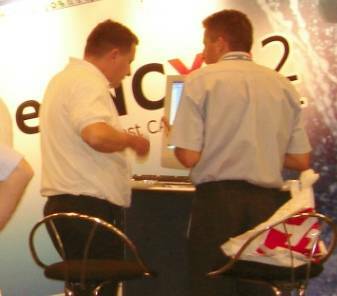 Here Allan OneCNC Denmark (left) is off to an early start demonstrating to a customer while Uwe OneCNC Germany Is behind on another PC demonstrating also. 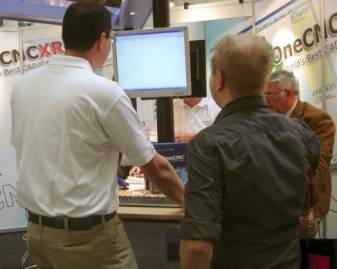 Multu Axis machining was a popular request at the show and we see Uwe OneCNC Germany (center) demonstrating OneCNCXR2 5 axis to customers. 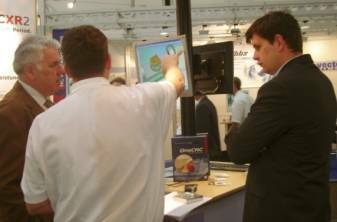 Stephan OneCNC Germany (center) is shown here demonstrating the benefits of OneCNC to customers. 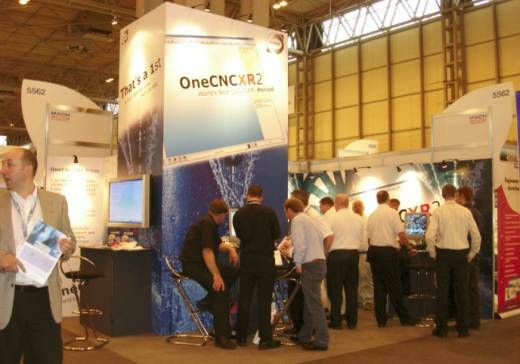 The Manufacturing Technologies Association (MTA), which organized the MACH2006 exhibition held in Birmingham, UK, in May, released official attendance figures for the event. 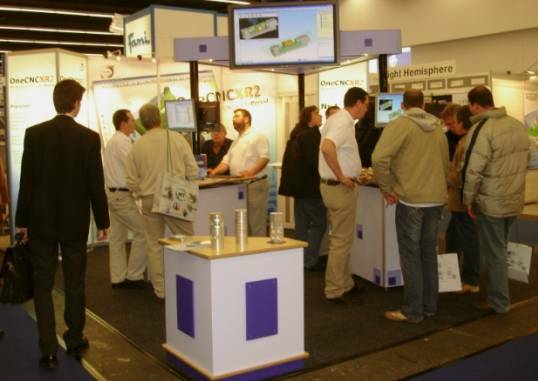 MTA reports that MACH2006 attracted 22,742 visitors, compared with 20,809 in 2004, for an increase of 9.2%. 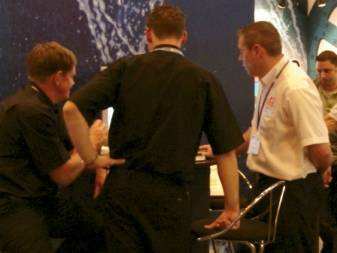 MACH is the UK’s premier manufacturing technologies event encompassing metal-cutting and metal-forming machine tools along with ancillary and related products and services. The number of exhibitors at the show also rose, from 480 in 2004 to 538 this year. In attendance for this show was Neil OneCNC UK, Peter OneCNC UK, Cassy OneCNC UK, Uwe OneCNC Germany and Bob from OneCNC Australia. 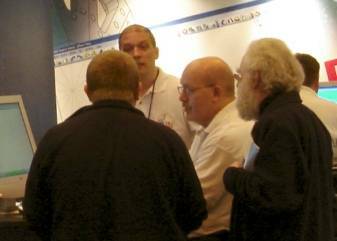 Here we see Peter OneCNC UK (third from left) doing a demo for customer while Neil OneCNC UK (second from left) answering the sales questions. 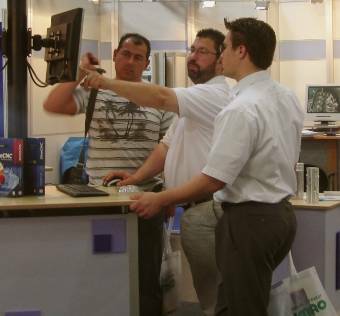 Here is Uwe OneCNC Germany (left) practicing his English and doing a demonstration for a customer. This is interesting we have Rob HaasCNC UK (right) doing a demo Of OneCNCXR2 to 2 other sales guys from HaasCNC UK (left).